Have you been looking for a simple way to spice up your everyday look? Statement necklaces might be your quick fix! While sometimes intimidating, statement necklaces can easily elevate your look without breaking the bank on an entirely new outfit. 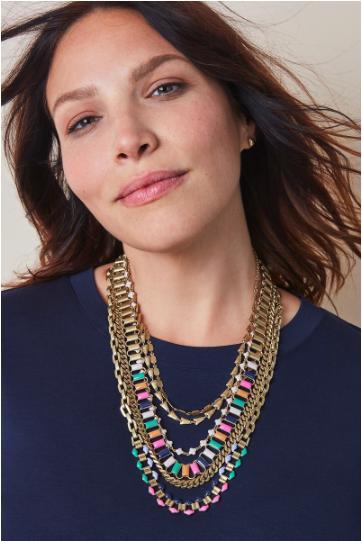 Here are a few tips on how you can style different types of statement necklaces, and if you are still unsure of what to wear, your Stella and Dot Stylist can always help you pick out the perfect piece for your personal style! Why choose when you can have both? By adding a mixed metal piece to your look, whether it be a bright and colorful outfit or monochrome, you can add a lot of dimensions. The Sutton Necklace is an ideal statement necklace because of its versatility. You can wear it long and loose, as a chunkier statement piece, just the sparkle strand or without sparkle completely! By having so many options, you get to choose what statement you make that day. Use a colorful statement necklace to brighten up your neutral outfits. Adding a brightly colored necklace can completely transform a bland outfit into a fun look! Try this style out with a dark or neutral outfit for an easy way to play with colorful statement necklaces. Pairing a graphic tee with a bold statement necklace will easily glam up your casual look. Pair a comfy tee with a statement piece, whether it be glam or edgy, to create a street style that is true to your personality. You can add a simpler statement necklace to a sleek shirt to create a fun, yet work appropriate look. Try to stick to neutral or thinner statement necklaces, rather than colorful and chunky pieces – they are not only easier to style, but the toned down look is a simple way to show off your personality while still being professional. If you really want to make a statement, but don’t want bright colors to do it, try something like our Emma Statement necklace. While the colors are more neutral, the sparkle and navy birds come together to create an interesting look. This is a simple necklace to pair with a monochrome outfit because you naturally won’t need any other accessories. Chambray shirts are classic and effortless, so styling them should be too. Easily add a bit of ‘oomph’ to your look by combining chambray and sparkle. You can either layer on top or wear underneath and leave a few buttons undone. A pearl necklace is a staple jewelry item for a lot of women, but why not spice it up a bit? The Eve Bib Necklace combines dozens of glass pearls with sparkly baguettes to create a gorgeous pearl statement bib that you can easily pair with either your favorite t-shirt or a dressier look to add a modern, yet sophisticated twist. Not every statement necklace needs to be large and in charge! If you don’t think you are ready to rock a chunky piece, maybe go for a longer, thinner necklace to elongate your torso and still be the key feature of your outfit. A less stressful way to begin wearing statement necklaces is to wear ones that are eye-catching yet dainty. The Essential Fringe Necklace is a great neutral toned statement piece that is very subtle but can still be the focal point of any outfit. You might already own a piece that can be used as a statement necklace and you don’t even know it! If you have a chunkier tie-back bracelet, like our Yves Wrap Bracelet, you can simply wear it around your neck as a statement necklace. While statement pieces don’t always have to just be necklaces, they definitely bring more attention up to the face. We definitely understand that trying out new styles can be a little scary at first. Statement necklaces can seem like a hard thing to style, but the key is to make them the focal point of otherwise simple outfits. Try to keep your other jewelry at a minimum so that your necklace can shine without any distractions. No matter the statement you are trying to make, Stella and Dot has you covered! 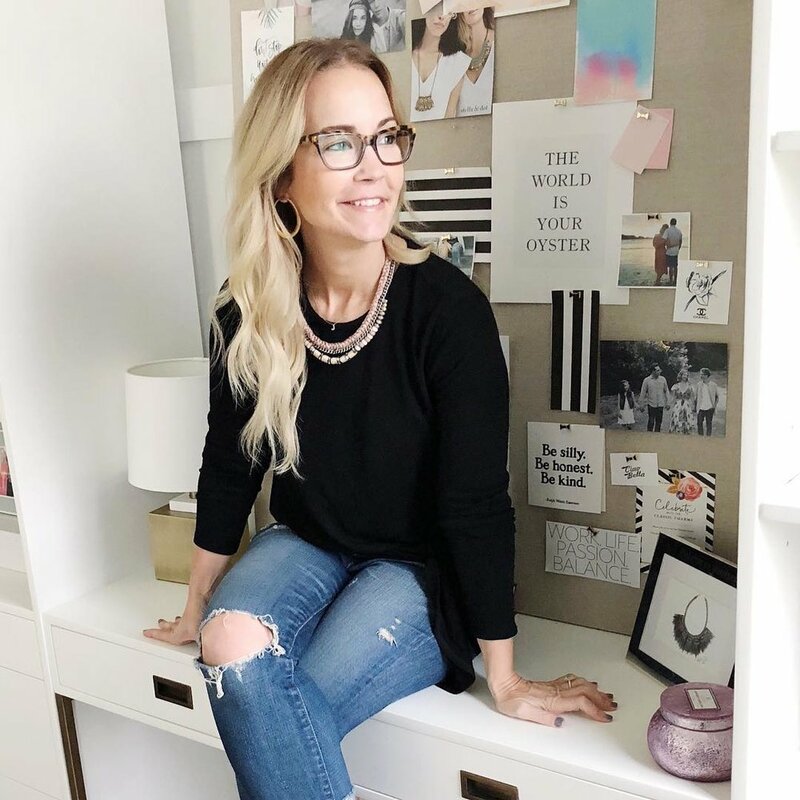 Remember, if you are still unsure on which statement necklace is right for you, reach out to your Stella and Dot Stylist and they can give you all the inspiration you need. Which Stella and Dot statement necklace fits your personal style? Let us know in the comments below!